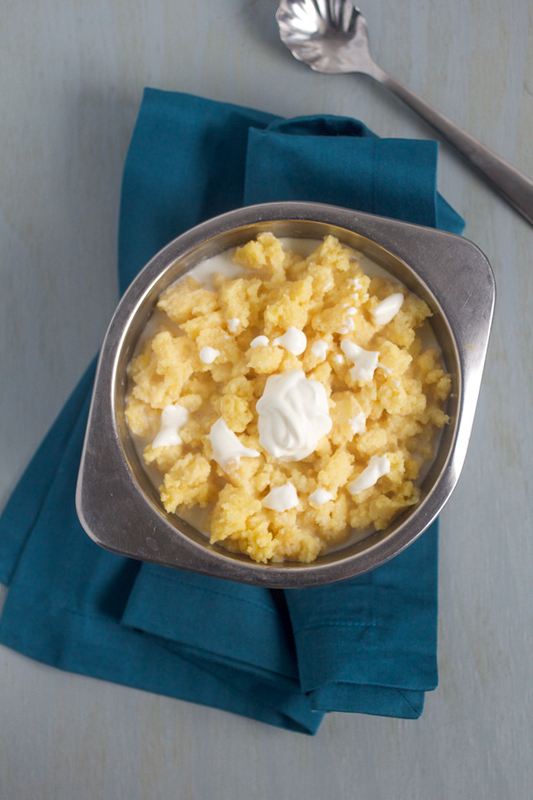 Polenta, or cornmeal porridge (pura), ranks among the Balkan breakfast favorites. This meal takes less than 10 minutes to make and will have everyone beg for seconds: from your children to mother-in-law. For best taste, combine with sour cream and (if you dare) minced garlic. You might want to consider something different but filling, something that becomes a hit as soon as the melted sour cream starts sliding down its sides, cooling it just enough to quickly put it in your mouth and close your eyes in pure pleasure. What I’m talking about is pura aka Balkan polenta, or cornmeal porridge. You’ve probably had polenta before. I don’t know what it is about polenta in Western cuisine, but every time I’ve ever had polenta in the US it was as a part of some uppity, hard to pronounce meal, and never by itself. I bet you too have had polenta at an upscale restaurant that was combined with 10,000 ingredients, and topped with special organic salmon bred and fished out only once every 73 years, out of some little known river somewhere near the Pacific, by a family that have been in fish farming for the past 7 centuries. Now I’m not completely disregarding the gustation pleasure derived from polenta made and served this way. But like a woman without makeup, polenta by itself is quite endearing. Preferable even. 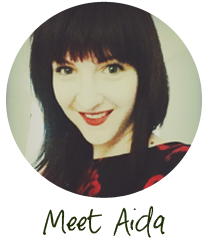 And since it only takes a few moments to make, why not try it at least once? Now on to a few technical terms. Polenta is a porridge like meal made from cornmeal. For this recipe you can buy either polenta, or medium ground cornmeal. Cornmeal is a much coarser version of corn flour, aka flour made from corn (or maize). 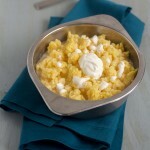 Please note I used Indian Head Yellow Corn Meal for this recipe (no affiliation). If you get the regular corn flour, the cooking may increase to 30-40 minutes, sometimes over an hour even. If you’re getting polenta, make sure it’s an instant form if you want to avoid long cooking times. In short: read the directions on the bag, regardless of what you end up buying. I find the taste is just as great with instant polenta as it’s with corn flour polenta, unless of course, your flour is coming straight from the flour mill. Polenta (pura) is best consumed hot to warm (be careful not to burn your tongue), as it hardens up relatively fast. It’s useless warming polenta up again, although (for other recipes) you can fry it at this point and serve as a side. 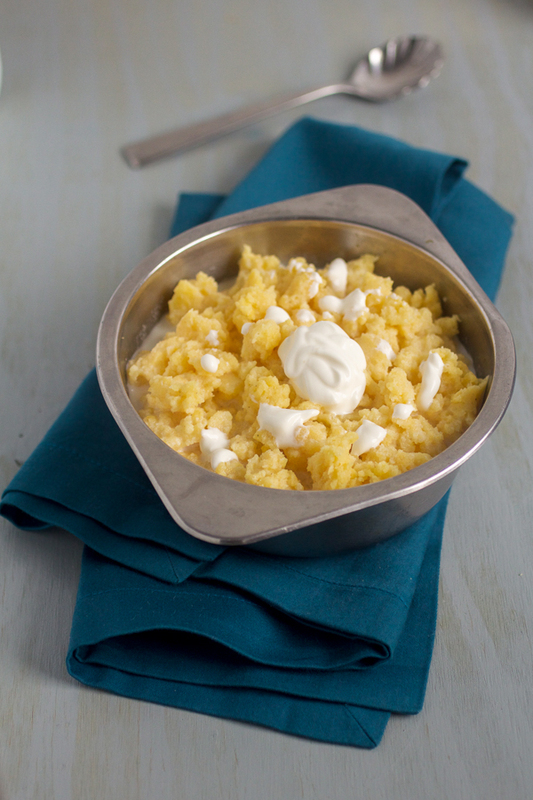 Some people like to pour milk, buttermilk, or kefir over their polenta in addition to the sour cream. You’re welcome to try all versions out until you find the perfect combination for you. P.S. May I recommend a few meals to eat porridge with? How about the drunken schnitzels? Sauteed spinach? And goulash of course! Combine water and butter and bring to boil on high. Lower to medium, and carefully stir in cornmeal. Continue stirring vigorously for 5-6 minutes, or until the mass is evenly whisked in the pot. 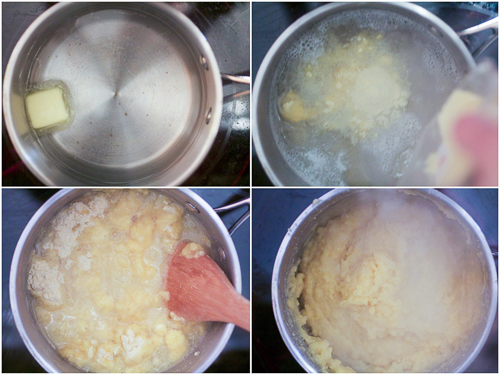 By this time the water will evaporate, and you’ll end up with a thick yellow mass. Remove and serve immediately. Top with sour cream, garlic, and buttermilk (optional). Put cornmeal with a fist of salt in open pot and boil for 15 minutes in enough water to ogrezne (i dont know english word, water reaches top but doesnt overflow). After boil drain excess water and let hot cornmeal evaporate. In the meantime use a wooden dowel to break up the cornmeal and prevent it from clumping as much as possible. The pura retains enough moisture, but in case not, add half a cup of water as needed. Pura can stand for a day or two, it goes together with cold fermented milk in summer after hot work on farm, or pura is served with hot zachina in winter when husbandcomes back from cutting wood. Fermented milk can be made by begging neighbor or buying 1 container of yoghurt with “active culture” and mixing (tip: break up the solid yoghurt with whisk until its creamy, it prevents clumping with liquid milk) with 1-3 liters of milk in a clean metal pot, making sure all ingredients and pot are a similar temperature. When thoroughly mixed, let it stand covered with a towel so the mixture can breathe for a day or so until it hardens, drain excess water (surutka or whey). This is much better than sour cream, commercial sour cream has gelatin as low-cost filler, so the taste is bland. Mix with pura in 1:2 volume. Zachina is made by mixing a teaspoon of salt, tbsp of finely fragmented goat cheese, 1-2 tbsp of kaymak, and cup of milk in a frying pan, its then heated to boiling and turned down to simmer until serving to preserve heat, served mixed in 1:1 mixture with pura. Kaymak is a type of milk product where full fat milk is boiled in a flat pot with large surface and cooled to form a skin, the skin is then collected repeatedly. A layer of the skin is placed in a wooden pot lined lightly with salt to preserve and flavor, the skin is then flattened, salted over, and the next layer is added. After a few dozen layers theres enough kaymak to add to zachina, use as a spread on bread, and so on.